Saturday Sailing, 22nd AND 28th June '14. Firstly apologies for the last of site update last week, but due to technicalities, the report was unavailable. However this means a "double helping" this week for you all! Phew what a scorcher. Its not very often we have pretty near perfect sailing conditions but yesterday came very close. The yachters enjoyed a light breeze and calm water. Carl was the only fast electric racer present and so had the water to himself. Scale boats were the best attended these included Daves steam powered tid tug, a plastic kit conversion of the Tirpitz and a large scale twin water jet powered Perkasa. Titus took along his J Class yacht and Joyce took along a large bowl of strawberries, thanks Joyce they were enjoyed by all. Lets hope the weather stays good for next weeks club 500 and yacht afternoon. Apologies again, but due to jobs at home taking priority currently, I was unable to attend poolside. 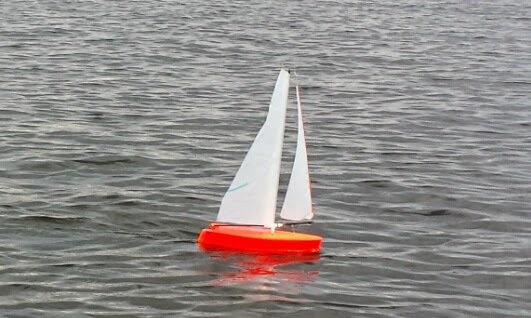 Heres a few pictures kindly forwarded by Paul, along with his sailing report. "Around 10 to 12 members turned up"
Firstly, my appologies for lack of attendance, but I have a lot of jobs to do around my home currently, the majority of them quite urgent, so my sailing time has been dramatically reduced. My thanks again to our Club Chairman Mark, for the sailing report and pictures. Firstly, apologies for lack of recent posts, but the inclement weather over the last couple of weekends denied all but the brave from sailing. Todays report comes from the pen of Mark,our Club Chairman. Unfortunately, due to a recent family bereavement, I am still continuing to sort a lot of things out at home.